The industry’s leading web-based contract management solution. YachtCloser provides a simple, seamless connection between buyers, sellers, brokers and yacht services through a sophisticated, yet easy-to-use application engine. YachtCloser provides the most accessible and robust transaction and administrative tools available – managing more than $10 billion in active boat and yacht contracts nationwide. 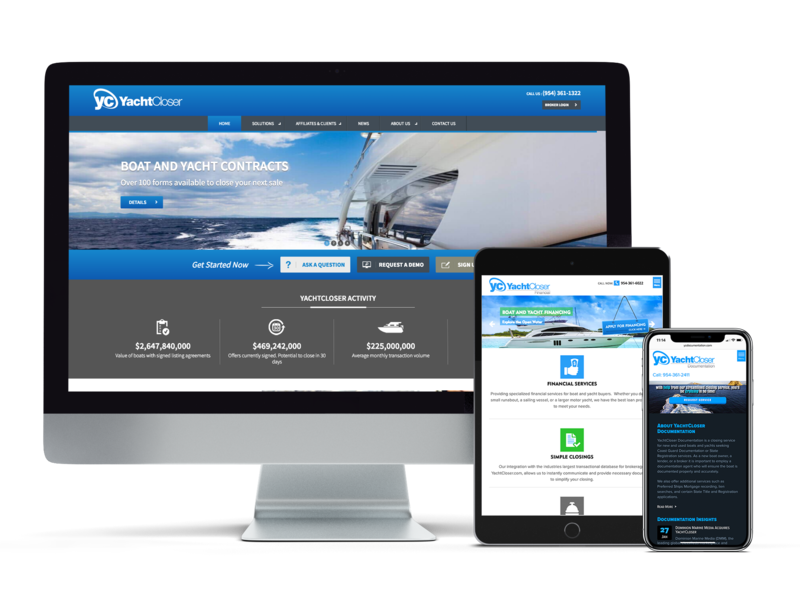 YachtCloser provides a simple and turnkey approach to managing all the forms and contracts needed to operate your boat and yacht sales business. YachtCloser comes pre-loaded with over 100 different forms and contracts ready for you to start selling boats. We’ve also partnered with the top broker associations in the country, allowing member-only access to their proprietary forms. YachtCloser’s proprietary electronic signature platform was designed with this industry in mind. Whether you’re representing the buyer and seller or you’re involved in a co-brokerage deal, YachtCloser allows all parties to quickly and securely electronically sign your documents with ease. YachtCloser Registration (YCR) specializes in providing Coast Guard Documentation, State Title, and Foreign registration services for boat and yacht buyers. YachtCloser Financial (YCF) provides specialized financial services for boat and yacht buyers. Whether your customer is purchasing a new boat, used boat, classic boat, or project boat, we’ll find the best loan program to meet their needs. With exceptional service and integrated solutions, we make the approval, deal coordination and closing process easy!